With economic improvements comes a natural growth generally within business, and growth normally means businesses are looking for larger or new offices to meet with their FUTURE PLANS. This requires sourcing of professional services in many areas, and of course IT infrastructure is a big part of an organisations expansion plans. Electrical Services, and being able to call upon a qualified contractor to install the basic electrical requirements within an office is an integral part of the planning process. 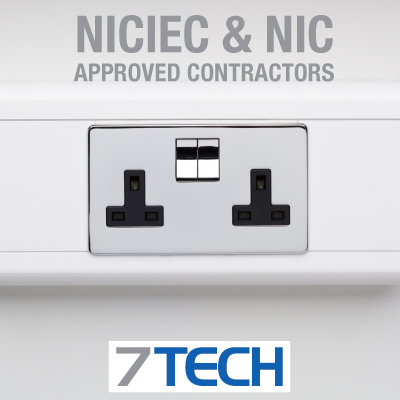 Our trusted electrical services partners are NICIEC and NIC approved Part P contractors, and work across a wide and varied project base, from wiring extensions to installing comprehensive security systems, and very often the simple tasks of adding new sockets and improve lighting. 7TECH have a long history in supporting our clients with this valuable service, and will work with you to plan the right infrastructure for your business. Careful planning and consideration is needed to meet with overall budgets, so allowing us to be part of your planning process for IT, Security, Fire Protection... starting at the basic electrical installation will give you peace of mind, reduced costly mistakes, and optimise the entire technology infrastructure of your new business premises. Contact the 7TECH team to plan your technology installations, and your electrical plans. We can help you future proof your new office environment, and install effective electrical infrastructure.